This figure shows the concentration of hematite measured by the Mars Global Surveyor Thermal Emission Spectrometer (TES) instrument. 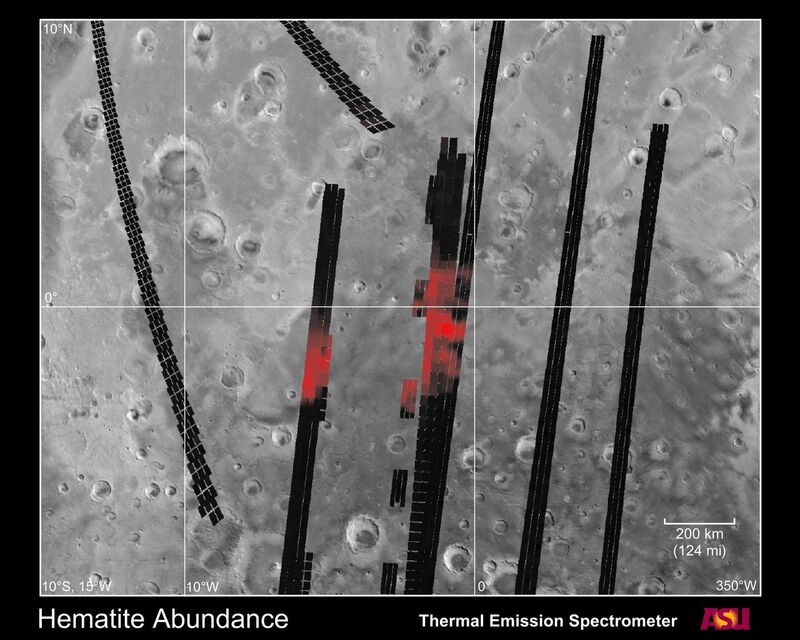 The abundance of hematite is shown in red, with increasing brightness indicating increasing hematite abundance. 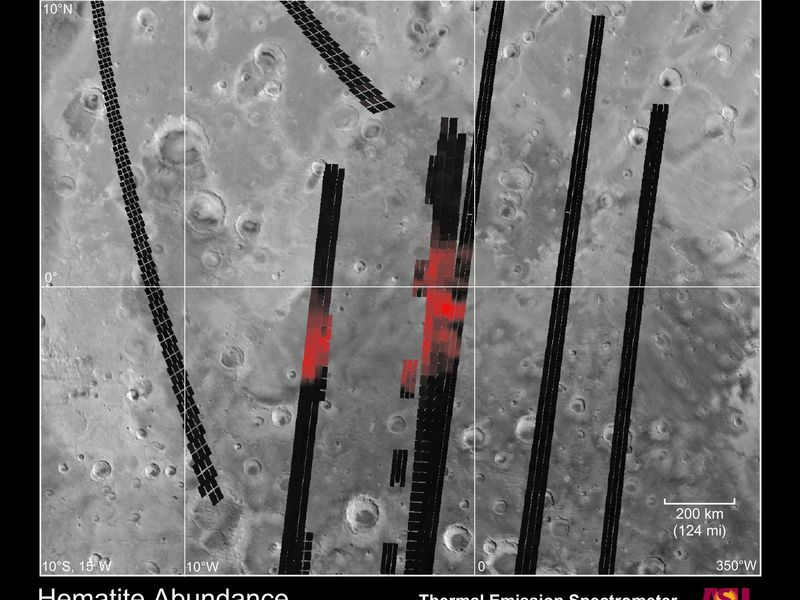 The location and size of the individual TES observations on the surface are indicated by the individual squares. 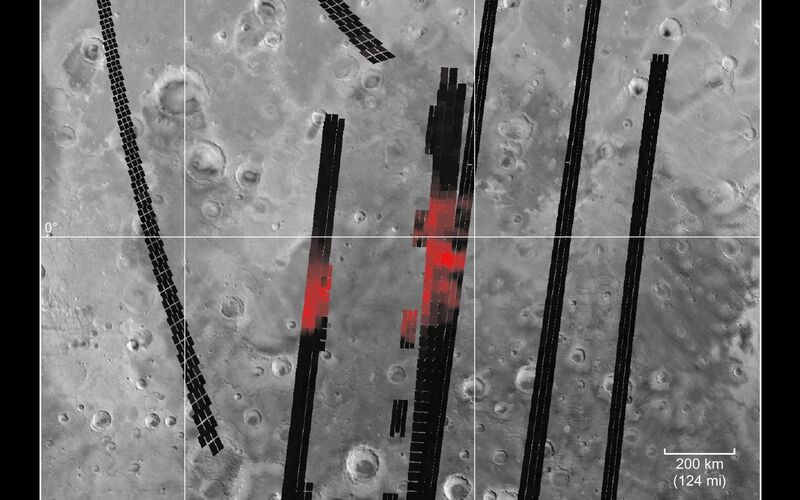 Black squares indicate observations with no detectable hematite. Data from 11 separate orbits acquired between Nov. 22, 1997 and April 25, 1998 are shown in this image. The TES data are superimposed on a Viking photomosaic for context. The image extends from 10 S to 10 N latitude and 350 W to 15 W longitude, covering an area 1500 km (940 miles) in longitude by 1200 km (750 miles) in latitude. The TES instrument was built by Santa Barbara Remote Sensing and is operated by Philip R. Christensen, of Arizona State University, Tempe, AZ. The MGS mission is managed for NASA by the Jet Propulsion Laboratory, Pasadena CA.